While scouring Twitter, you might have come across a tweet or two from President Donald Trump lambasting U.S. corporations and government officials for running trade deficits with certain countries. First, a little Economics 101. A trade deficit results when the value of our imports from a specific country exceeds our exports to them. If the value of our exports to a country is greater than the value of our imports, it is called a trade surplus. Despite what you might read on Twitter, trade deficits are not bad. After all, it merely means that U.S. citizens are in a financial position to purchase many of the products that make their lives easier. In fact, one could argue that a trade surplus means that the U.S. economy is faring poorly. But for politicians who like to read these figures as though they were a football score, a trade deficit is unacceptable. And the one deficit that the current administration is upset about is the one that the U.S. has with with China. While current numbers show the U.S. running a $375 billion deficit with China, that figure is distorted by the Apple iPhone. Citing a figure from IHS Markit, Reuters says that Apple spent $258 on average to make each unit of the iPhone 7 and iPhone 7 Plus. The phones are assembled in China. With 61 million units shipped last year, the iPhone 7 and iPhone 7 Plus accounted for approximately $15.7 billion, or 4.4%, of the U.S. trade deficit with China last year. 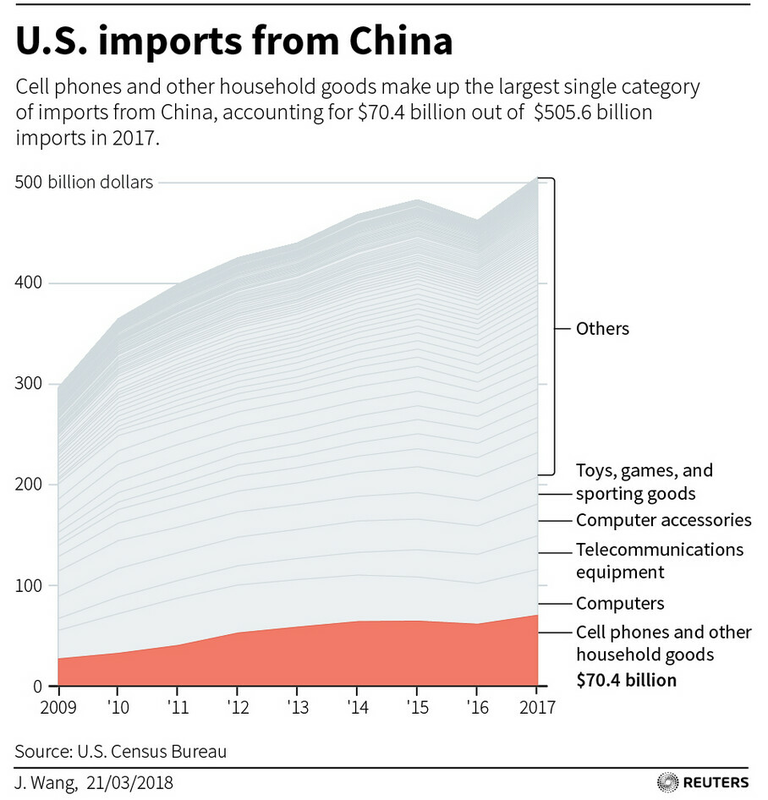 The iPhone also made up 22% of the $70 billion in cellphones and household items that were imported into the states from China in 2017. Apple has responded to the president by telling him that the company plans on sourcing more supplies from the U.S. At the beginning of this year, Apple said that it will pay U.S. suppliers $55 billion in 2018. This past weekend, 45 U.S. trade associations representing several major corporations, called on the president not to place tariffs on Chinese imports. These organizations said that doing so would be "particularly harmful" to the U.S. economy and consumers. An estimate from the Information Technology & Innovation Foundation says that a 10% tariff on imports from China would reduce the output of U.S. goods by $163 billion over the next ten years. A 25% tariff would nearly double the effect. This is incorrect. No country can indefinitely sustain trade deficit with outside world without repercussions. You have to ask yourself where the money to pay for disbalance comes from. It is called debt. And the debt is piling up to unsustainable levels. Calm down, they're not trying to be economists, they are trying to write a fluff piece for the iPhone. They aren't iPA for nothing, this is what they have to do in order to give free ad space to the iPhone to get their sweet invites to Apple events. As for the BS on trade deficits, they are absolutely wrong and you are right. It is fairly common sense that money flowing out of your country is unsustainable. You guys are agree to work against US if this helps to get rid of Trump. No matter what good things he did for the ppl in US and the World. They aren't working against the US, and they're absolutely right in this instance. A trade deficit is not debt. They're totally unrelated. And tariffs will harm the US economy as much our more than our trading partners. That's why ever economist has come out against them. Unfortunately, we have a president who is the least knowledgeable and most inept we've ever had, and he has zero understanding of even basic economics. He even admitted recently that he just makes up facts to suit his narrative (claiming a trade deficit with Canada while we actually have a trade surplus). Oh yes it can be. Remember it took the Soviet Union more than 60 years of spending beyond its means on an arms race before it collapsed. You're comparing deficit spending to a trade deficit. Totally unrelated things. Deficit spending is spending more money than you take in. A trade deficit just means a trading partner sells more to you than he buys from you. It doesn't mean you're spending more than your taking in. "As for the BS on trade deficits, they are absolutely wrong and you are right. It is fairly common sense that money flowing out of your country is unsustainable." You both are incredibly wrong. Here is a Forbes article on the get subject:https://www.forbes.com/sites/simonconstable/2017/02/27/mr-trump-heres-why-trade-deficits-are-good/ And here is an extert towards the end of said article: "The deficit itself ends up being financed by the country with the trade surplus. In simple terms, China funds the huge U.S. trade deficit by lending money, currently at ultra-low interest rates. That means that China is helping finance the U.S. economy. That’s a good thing." You here buzz words from right-wing idiots about how awful trade deficits are, but in many cases, deficits alleviate economic stress. Hell, in some strange cases you see the GDP rise as deficits increase. As for your first paragraph... seek psychiatric aid for your ailment. That's all I have to say. Oh a btw... debt incurred in this instance will likely never be of importance. Go ahead, just watch the price of iPhones rise 10% then. 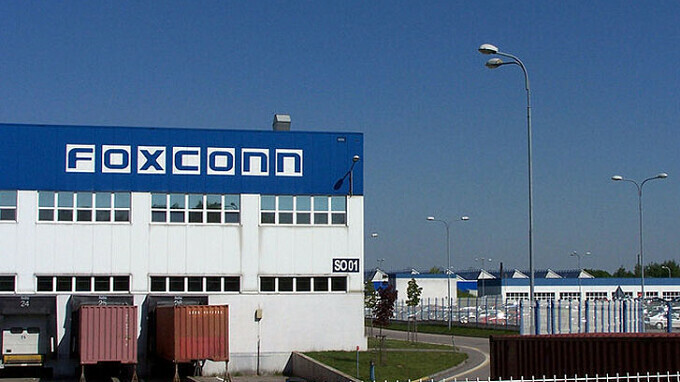 Apple actually buys it's iPhones from Foxconn. Apple sells Foxconn the parts. Foxconn builds an iPhone. Apple buys the said iPhone from Foxconn. It's worked that way for years, this means Apple is buying a Chinese product and would be subject to tarrifs and if you think Apple would not pass that price increase on to the customer then you are dreaming. IMPEACH TRUMP AND SAVE APPLE AND THE COUNTRY!